Otto Osmers and Shelley Edmundson of the Fishermen's Preservation Trust show results of winter harvest off Menemsha. Kelp farming has the potential to become a cottage industry on Martha’s Vineyard that provides a healthy, local food source, a winter experiment off Menemsha has concluded. 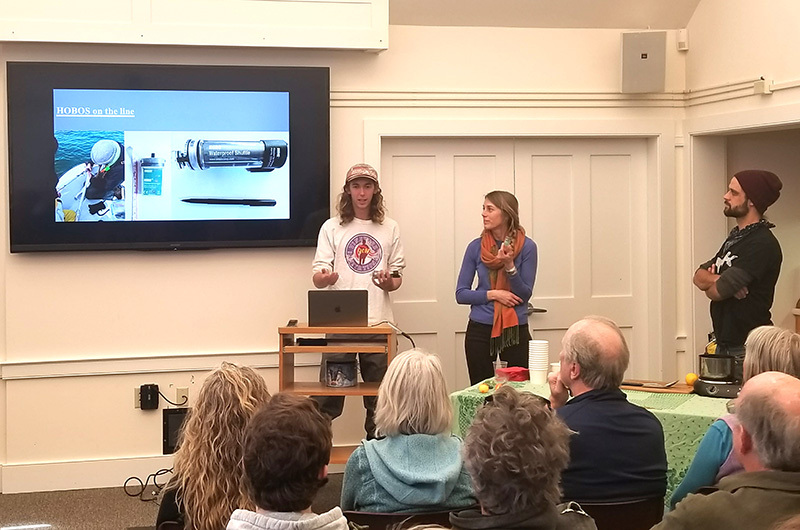 The Martha’s Vineyard Shellfish Group and Fisherman’s Preservation Trust recently presented the findings to a large crowd at the Chilmark library. “This little experiment is the best kelp grown in the entire state,” shellfish group co-director Amandine Hall said as samples of the slippery algae were passed around the room. Kelp is a native plant that requires little training or equipment to grow. And it grows best in the winter months, Ms. Hall said. The sugary seaweed has many culinary uses, said Otto Osmers a fisherman’s trust intern who spearheaded the project. And Ms. Hall called kelp a sustainable food since it requires no land or fertilizer. Chef John Thurgood of the Beach Plum Inn cooked a pot of kelp soup with scallops for the crowd to sample. The soup had a crunchy texture and slightly salty flavor. “It has more calcium than milk, more iron than spinach and more fiber than brown rice,” Mr. Osmers said. “This is really exciting to me as a chef when something new comes in,” added Mr. Thurgood. The winter experiment wasn’t the first for the shellfish group. In 2013 a kelp-growing experiment was conducted in Island ponds using a grant from the Edey Foundation. Ms. Hall said the experiment found that kelp needs more circulation to thrive. Swirling saltwater currents off Menemsha made for better conditions, so the shellfish group applied for permits to conduct a second experiment there last year. The fisherman’s trust joined as a partner in the venture, and last November Mr. Osmers sank a 100-foot line in the waters off Menemsha. The pilot kelp farm took a beating from winter storms in February and March, but Mr. Osmers was able to harvest 50 feet of dark, nutrient-rich kelp in recent weeks. Ms. Hall said it was the highest quality kelp in the region. Experiment was conducted in waters off Menemsha. “It’s quality over quantity here,” Mr. Osmers said. She said the financial benefits of growing kelp are questionable, since it still can only be grown in small quantities. The state Division of Marine Fisheries has not developed stand-alone kelp farming permits, so kelp farmers must already be established in another industry. 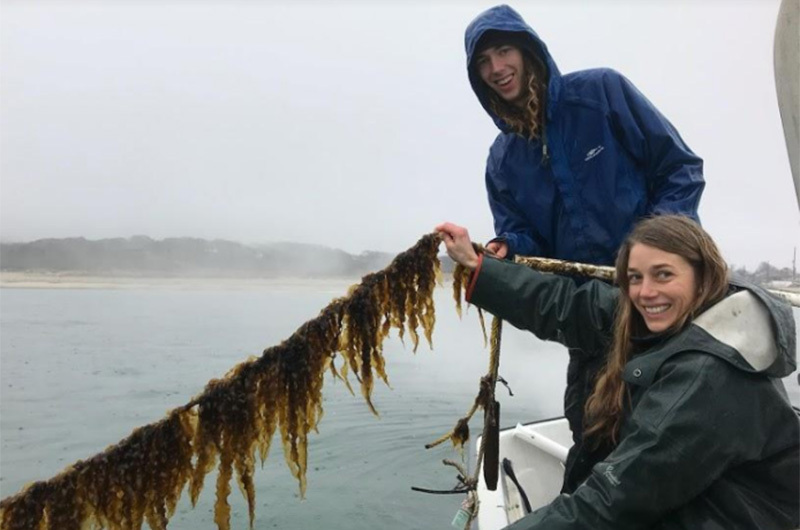 “I don’t think [kelp farming] will become huge, but I think it has the potential to be a supplement for people doing other things on the water and don’t want to put all of their eggs in the same basket,” Ms. Hall said. She expects to prepare a final report on the kelp experiment this month. 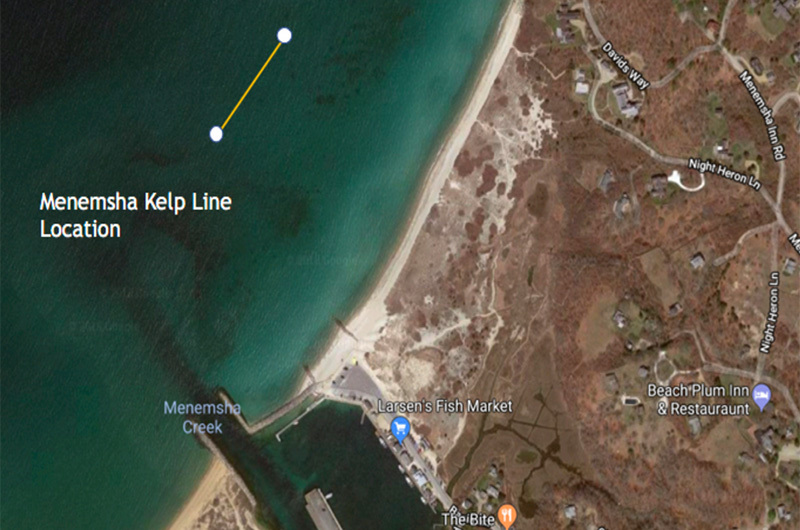 Two Island fishermen have commercial kelp-growing permits so far: Greg and Dan Martino, who own Cottage City Oysters in Oak Bluffs, and Stanley Larsen, a Chilmark shellfisherman and fish market owner. Mr. Larsen also operates the only blue mussel farm in the state. Dan Martino said while he and his brother only grow small quantities of kelp, they have found brisk demand in the community. He said this winter he expects to sell about 100 pounds of kelp to Island chefs for use as a superfood. “One hundred pounds is nothing to be selling in the grand scheme of things, but we’re able to provide a clean, organic, and raw product,” Mr. Martino said. Very tasty and hope this group gets supported by the island to bring this to reality. Awesome presentation! Otto you are the man! Congratulations on this kelp initiative. The Irish have been harvesting their sea vegetable “dulce” for centuries. Look up www.seaweed.ie. The Irish harvest their dulce of their rocky beaches as well. You can use kelp to make pasta much as you would make spinach pasta and serve water shellfish and fish. Sort of an O’Chipollina”. The French call theirs “spaghetti de met” The marketing model to review AlgAran - Organic Irish Seaweed Products for Health and Beauty. MV Algae! go for it! Great job to all! Go Otto! Go Shelley! Go MV Shellfish group! A sign of things to come! Kelp would be an excellent addition to miso soup!